As you know, I’m usually a pretty big advocate for home cooking with organic and non-processed ingredients. But sometimes, I make exceptions. I know, you can buy these in a convenient little box, straight from your grocery store. You can assemble, bake and eat them in under 30 minutes, but my version is just a little bit better. Someone please validate me. Tell me it’s okay. Canned crescent rolls have their place, don’t they? And everything in moderation – even highly processed convenience foods? Sigh. Preheat oven to temperature specified on crescent roll package. (Ours was 375 degrees F). Prepare a large baking sheet with parchment paper or a silpat mat. Unroll the crescent roll dough and separate the triangles. 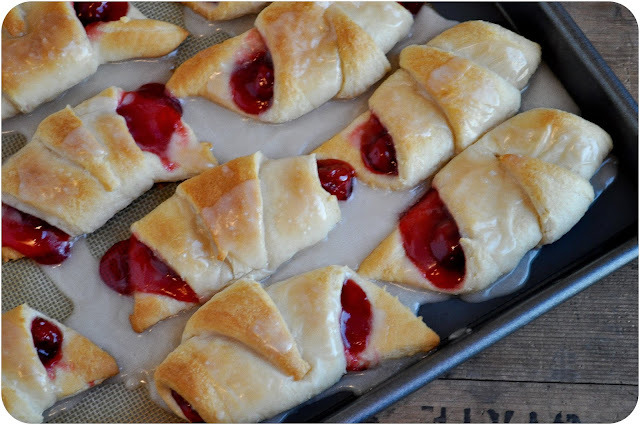 Place a heaping tablespoon or so of cherry pie filling at the wide end of each crescent roll, and gently roll it up. Place on baking sheet, and bake according to package directions, 10-12 minutes or until golden brown. While baking, prepare the glaze. Combine confectioners sugar, cream and vanilla in a small bowl and whisk until smooth. The glaze should be thin enough to coat and run off a spoon, so add more sugar or liquid as needed to achieve desired consistency. Generously pour glaze over hot rolls, and enjoy warm. 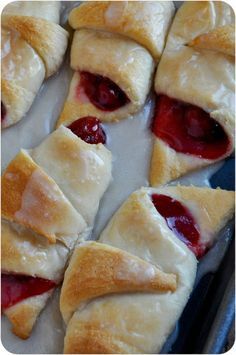 0 Response to "Easy cherry turnovers "